Cuba was the first country to produce cement in Latin America, on July 7, 1895, two years before Brazil. The Cuban cement industry now bears the scars of its politics. The nation’s cement makers have to use some of the Western world’s most outdated equipment, and are producing at low levels of capacity utilization only 90 miles from one of the world’s most cement-hungry nations, the United States, which refuses to trade with Cuba. 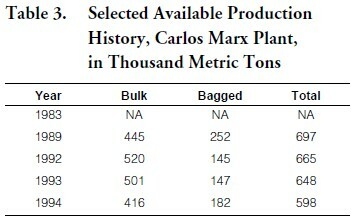 Gray cement production in Cuba was 1.08 million tons (Mt) in 1994, compared to 1.05 in 1993, but 3.79 in 1989. 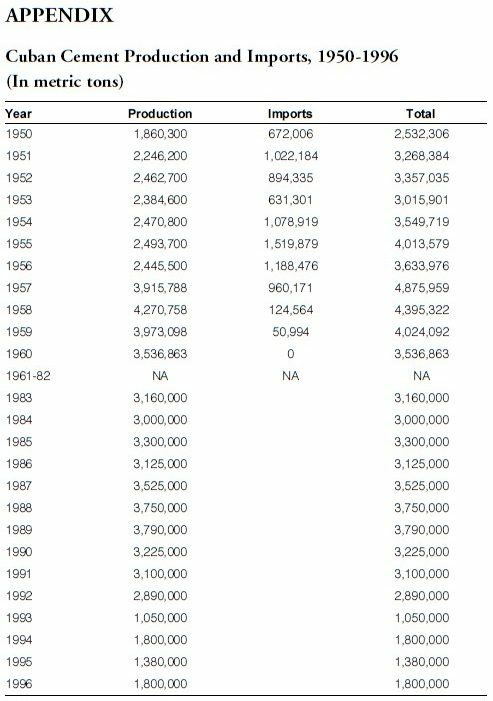 Statistics on Cuban production and imports of cement for the period 1950-1996 are provided in an Appendix. This bizarre situation has arisen as a by-product of the Cold War, when the United States and the Soviet Union staged a power struggle in Cuba that brought the world to the brink of nuclear apocalypse. However, the roots of Cuba’s problems effectively date back several centuries. Spanish colonies were established on the island in the early 1500s, with the Spanish dominating trade in sugar, leather and copper over four centuries. Cubans struggled for a hundred years for their independence from Spain, and the decisive battle for their freedom was fought in 1895, the same year as the inception of the cement industry in Cuba. The freedom-fighters were led by Antonio Maceo, Máximo Gómez and José Martí, and the latter’s name and image is celebrated throughout the world as Cuba’s national hero. After the United States invaded Cuba in 1898, a series of governments followed, culminating in the dictatorship of Fulgencio Batista from 1934 to 1958. Castro and his guerrillas took over power in 1959 and realigned Cuba’s politics to parallel those of the Soviet Union. The country’s three cement plants were nationalized by Castro under the administration of the Unión de Empresas de Cemento (UEC). The United States has since waged an economic war against the island, partly in revenge against the nationalization of the extensive pre-Revolutionary American assets on the island, including Lone Star’s massive facility at Mariel, and partly through its concern over the state’s communist politics. Cuba’s economy has taken a beating over the last three decades, and has suffered acutely since 1989, due to the collapse of the Soviet Union and the effective drying-up of Soviet aid. Trade links with former Soviet-aligned states have also weakened considerably. Cuba has had to reform trade ties with its South American neighbors, which amounted to only five per cent of exports in 1989, but which are now at close to 40 percent. With no hard currency to pay for foreign equipment, the Cuban cement industry has become a veritable time capsule, with virtually no new equipment being installed over the last seven years. Plants have had to innovate, cannibalizing components from older inoperable kilns, as well as machining their own components. The collapse of Cuba’s traditional ally and paymaster has led the government to water-down its isolationism, and led the Executive Committee of the Council of Ministers to issue Agreement of Administrative Control No. 2712 in October 1993. This ten-year agreement authorized the Unión de Empresas de Cemento to form a mixed company with Cemex SA of Mexico. The two organizations set up a new company, Empresa Mixta Cementos Curazao NV (EMCC), based in Curacao, with shares split equally, and the Mariel plant being sold to the new company. The formation of Cementos Curazao was partly necessary to circumvent the trade embargo against Cuba. For the operation of the new plant, the UEC formed a new organization in 1994, the Empresa de Asistencia Técnica y Servicios, which is responsible for the administration of raw materials, workforce and technical matters at the plant. Cemex provided the bulk of the technical personnel for the organization. The EMCC also exclusively authorized Cemex to export cement from the Mariel plant, and from Cuba’s five other plants. Faced with the uncertainty that its executives would fall under the sanctions of the Helms-Burton (Libertad) Act, in May of 1996, Cemex notified the U.S. government that it had withdrawn from Cuba and was no longer in business there. Details of the equipment and operating techniques of Cuba’s six cement factories are given below. Cement plants in Cuba are regarded as strategic installations and as such are presently off limits to foreigners. Lone Star Cement Corporation of the United States focused its attention on Cuba after noting that the island was drawing considerable cement imports at the beginning of the 1900s. The imports occurred even with the operation of South America’s first cement plant, “Fábrica Cuba,” which started production on July 7, 1895, and which closed in 1910, and the El Almendares factory, both in Havana. At this time, Lone Star had a domestic cement production monopoly, and decided to install a third kiln. The government subsequently decided to award CCCP a market monopoly guarantee, which lasted for four years and which allowed the company to install another three kilns at the site, although they were subsequently moved and reinstalled in Brazil in 1931-34. Between 1945 and 1951, Lone Star installed another three kilns on the Mariel site, and brought total production from the plant to 0.33 million tons per annum (Mta). Faced with the prospect of losing its monopoly on Cuban cement production, Lone Star attempted to acquire the plant which was under construction near Santiago de Cuba. The Mariel plant was nationalized by Revolutionary Resolution No. 3, on October 24, 1960 and renamed “René Arcay.” The plant takes its revolutionary name from the organizer of the strike of April 9, 1958, who was killed by a self-made bomb which exploded in his own hands. Production levels at the plant decreased in 1961, as the combined effects of poor quality kiln refractories and the U.S. embargo began to bite. In 1973, Centunion de España was contracted to supply two KHD Humboldt-Wedag dry-process cement kilns for the site at Mariel. The newest kilns at the site are fitted with planetary coolers and each has a clinker production capacity of 0.74 Mta. Raw material is crushed by a 750 ton-per-hour (tph) Centunion hammer mill, before being dried to eight per cent moisture content, and ground by two KHD closed circuit ball mills. Clinker is ground in two 16 meter-long 165 tph ball mills and is stored in four Claudius Peters silos, each with 10,000 ton capacity. The plant is adjacent to its own cement loading quay and supplies cement to barges by conveyor at a maximum rate at 300 tph. The first of the new kilns entered service at the end of 1979 and the second at the end of 1981. The installation of the new kilns effectively changed Mariel from being the oldest operating cement plant in Cuba to the most modern, and made it the most attractive target for foreign investment and capital participation. The plant is situated 90 kilometers West of Havana and, with Mariel, supplies Havana with the majority of its cement. The site was first used in 1919, when a lime works was set up by Manuel Domínguez Morejón, with limestone being extracted from the quarry using pickaxes. In 1952, a horizontal lime kiln was commissioned, and two more lime kilns, commencing in 1958 and 1959, brought the site’s total number to six. Starting in 1954, Morejón, together with “Papo” Batista (son of the dictator) and General Luis Robaina Piedra organized the acquisition and setting up of a 2.74 meter diameter by 99.1 meter long Unax FLS wet-process rotary cement kiln from the American Cuban Manganese Company (ACMC). The kiln started operation on September 18, 1957, and produced 1,873 tons of clinker in its first month of operation. Other equipment in use at this time included a Folax clinker cooler, two Unidan slurry ball mills of 26 tph capacity and a St. Regis bagging machine. In 1959-1960, the plant was nationalized by Castro’s new government, and took the “Mártires de Artemisa” name after the martyrs commemorated by the town. Starting from 1961, the cement plant suffered periodical closure due to lack of spare parts. An increase in construction in the 1970’s led to an increase in cement demand, and in 1973, Fives Lille- Cail signed a contract to expand cement production at Artemisa from 0.2 Mta to 0.6 Mta. New equipment installed at the plant included a 400 tph Dragon hammer mill, a three chamber 3.4 meter by 14.7 meter long ball mill for slurry, a 4.4-4.8 meter diameter by 151 meter long wet-process rotary kiln with a production capacity of 1250 tons per day (tpd), a five-chamber grate cooler with 39.1 square meter surface area, a tubular ball mill with 64 tph capacity at 3200 blaine, two four spout packing machines and a weighbridge for cement trucks. The new kiln started production in February 1976, with a monthly production of around 17,000 tons. Pozzolanic cement production (PP250) started at the plant in 1984, with tuff trucked from Mariel each day. It is estimated that 40 percent of the plant’s output is in the form of PP250, which has a tuff content of around 20 percent. The kiln started to burn Cuban crude oil as fuel in 1990. Cement is bagged at the plant using FCB bagging equipment, and is transported to Havana on trucks, in (decidedly ancient) powder tankers and by rail. One Cuba’s most modern cement plants is located 15 kilometers Southeast of Cienfuegos, on Cuba’s Caribbean coast. The Cuban government decided that the planned construction growth in the 1980’s warranted the construction of another cement works, and the Cienfuegos site was chosen for four main reasons: the high quality of both limestone and marl in the area, its central location, the pre-existence of an industrial development zone, and the possibility of exports to South America through the nearby port. A Cuban trade mission was sent to the former East Germany in September 1972, and a contract was signed in March 1973 for the supply of all equipment for a dry-process cement plant. Construction work on the plant commenced in January 1974, and the first kiln was commissioned in February 1980. Both Castro and the reviled former leader of East Germany, Erich Honecker, attended the inauguration of the plant in May 1980. Limestone is crushed at the quarry in a 600 tph double impact hammer mill before being conveyed 2.5 kilometers to the plant. Two roller mills, each with 230 tph capacity, are installed at the plant and are used prior to a drying stage. The raw material was originally thought to have a moisture content of 6 percent, but when it was discovered that it was closer to 27 percent, a rotary drier 5 meter and 35 meter long was commissioned. Raw material leaves the 200 tph drier with a moisture content of around 8 percent. The works operates three dry-process kilns, each 4.6 meter diameter and 69 meter long, with a rotation velocity of 1.8 rpm and an individual clinker production capacity of 1500 tpd. Each kiln line is fitted with an electrostatic precipitator, and clinker from the kilns is transferred to one of three grate coolers, each with a surface area of 62 square meters. Cooled clinker is fed into the three SKET two-chamber ball mills, each 4 meter diameter by 12 meter long. The plant also has storage for 5850 tons of gypsum and 8200 tons of pozzolanas. The milled cement is subsequently packed by the three 14-sprout rotary packers, each with a capacity of 2000 50 kilogram bags per hour. In 1992, the Carlos Marx plant commenced production of CC-200 cement, which consists of up to 60 percent pozzolana. The plant also manufactures PP250 and P450 cement. The plant is situated almost exactly in the center of the country, between Sancti Spíritus and Ciego de Avila. Geological exploration in the area of the plant commenced in 1950, although it was not until after the revolution that a contract for the new plant was signed. Prerovsky Strojirny of Czechoslovakia supplied four wet-process rotary kilns to the site, each 3.5-4 meter diameter and 126 meter long. The kilns are supplied with slurry after the quarried limestone has been crushed by the two 210 tph double shaft hammer mills and further milled in five 40 th open-circuit 14 meter long ball mills. The kilns have grate coolers, and three two-stage closed-circuit 40 tph cement mills are used. Three 14-sprout rotary packers are used to pack the cement, at a maximum rate of 1200 bags per hour. The establishment of an energy efficient dry-process cement factory at Cienfuegos inevitably has led to a reduction in the output of the relatively inefficient kilns at Siguaney. To counter this mid-1980s trend, the plant has experimented with alternative fuel sources, including peat and rice husks, apparently with some success. However, the National Energy Commission suggested the use of Cuban crude oil as an energy source in 1986, even though there were known to be problems with the potential use of the fuel in terms of its high viscosity, low ignition point, high sulfur content and transport problems. In 1987, Cuban crude oil was used experimentally as a fuel for the first time in two Siguaney’s kilns, and since 1991, crude oil has been used exclusively to fuel the kilns at the site. Siguaney is also the site of Cuba’s white cement production. The plant is located on Cuba’s northern coast, 550 kilometers East of Havana. The plant has its roots in the 1929 construction by Lone Star Cement, of a quay on the Bahía de Nuevitas as well as eight silos and bagging machines with a capacity of 6000 bags per day. Bulk cement was transported from the plant at Mariel for redistribution to the eastern provinces via the facility at Nuevitas. During the construction boom of the 1960’s, it was decided to build a cement plant at Nuevitas and equipment was ordered from the former East Germany. The first kiln line to be completed, in 1968, consisted of a wet process kiln, 3.6 meter diameter and 150 meter long, with a 0.2 Mta clinker production capacity. On April 9, 1968, the plant, named after the day on which Castro’s rebels assaulted the Moncada Barracks in 1953, was opened by Fidel Castro himself. By April 1973, another line was ready for production at the plant. This line consists of a second 0.2 Mta wet-process kiln, with tandem slurry and clinker mills, and another cement bagging machine. On July 19, 1973, the third and last production line was commissioned, with a third kiln, a fourth slurry mill and a fourth clinker mill. In 1979, cement transfer stations were installed permitting bulk-cement barges of 5000 ton capacity to be loaded on the Bahía de Nuevitas. Electrostatic precipitators were fitted between 1987 and 1989. In 1989, the use of Cuban crude oil as a fuel was started at the plant, as a means of deal with Cuba’s low levels of hard currency. By 1993, Cuban crude oil had replaced the former sources of energy completely. The plant currently has an installed capacity of around 0.6 Mta. The plant supplying Santiago de Cuba (Cuba’s second city and Capital of the Revolution) with cement, currently called “José Mercerón,” was constructed in 1955. Imports from Puerto Rico, largely from a plant in Ponce, were the main source of cement prior to the establishment of the works. An international group of investors and business people, realizing that there was sufficient demand at the Eastern end of the island for cement production, set up the Compañía Industrial y Comercial Marlex to build the plant, and in 1953 Cementos Nacionales SA was formed to operate it. By the start of the production at the plant in 1955, the Cuban national family Babún owned 79 percent of the shares in the facility, and Cementos Ponce of Puerto Rico, under the direction of the Ferré family, 21 percent. However, Cementos Ponce provided technical help and operators for the plant until 1960, giving it more influence over the operation of the plant. Starting in May 1955, the plant was initially operated only as a grinding station, with clinker from Ciment D’Obourg in Belgium and from Puerto Rico being ground in two Fellner & Ziegler three-chamber cement mills, each with a capacity of 16 tph. By November 1955, the plant was ready to produce clinker of its own. A Hazamag 250 tph double-rotor hammer mill was used to crush the raw materials and two Fellner & Ziegler paste mills used to prepare raw materials for the kiln. The wet-process kiln, also manufactured by Fellner & Ziegler, is 3.6 meter diameter by 130 meter long, with a clinker production capacity of 408 tpd. The cement is packed using a Haver & Boecker packer with a capacity of 1200 bags per hour. A second wet-process kiln was put into operation in May 1957, and this effectively ended Puerto Rican cement imports into Cuba. The kiln was manufactured by Allis Chalmers, with a diameter of 4 meters and a length of 160 meters, and has a clinker production capacity of 680 tpd. The kiln feeds into a Fuller grate cooler and clinker is subsequently milled in an Allis Chalmers three-chamber ball mill. A further expansion at the plant was planned for 1958, but the revolutionary struggle disrupted industry and communication, forcing the postponement of development. However, after the completion of the revolution and the nationalization of Cementos Nacionales in 1960, the government ordered a new kiln line from Industrial Export of Romania. The use of white cement has a long history in Cuba. 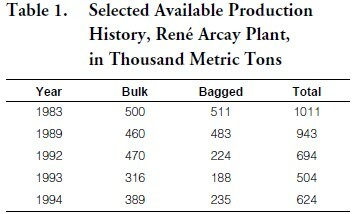 In 1912, 5000 tons were imported from France, and by the mid 1980s, around 30,000 tons were being imported annually. In 1986, the feasibility of producing white cement at the Siguaney plant was studied, and the search for suitable raw materials started. Very pure white limestone was selected from the quarry at Guayos, 20 kilometers from the plant. Feldspar from Macagua and gypsum from Punta Alegre were also selected for use in the first experimental batch of production. In October 1986, kiln No.2 at Siguaney was used to produce white cement for the first time in Cuba, and based on this successful test run, the Onoda Cement Company of Japan was contracted to equip a 0.l Mt white cement production line at the plant. Equipment supplied included four raw material feeders with conveyors and an elevator, two 2,000 ton clinker silos, conveyor belt systems and a special burner from Onoda for the kiln. Siguaney’s kiln No.4 has been designated for white cement production since July 1989 and now produces at close to capacity. Around 55,000 tons of white cement raw material slurry is produced each year, converting to some 31,000 tons of clinker and then to 30,000 tons of white cement. Changes to the raw mix composition, with the elimination of imported fluorite, Macagua feldspar and siliceous sand, and the introduction of kaolin from Gaspar, near Ciego de Avila, have significantly reduced costs of production. The raw mix changes have also led to a product with increased whiteness: 90 percent compared to the original 86 percent. Until the precipitous downturn of the “special period,” cement had enjoyed a prominent place among industries with the fastest rates of growth in Cuba. The most significant growth occurred after 1970 when several important factories were built and existing ones were expanded. Moreover, the growth in cement production promoted rapid expansion in the allied industry of construction materials. Crushed rock production jumped from 2.5 million cubic meters (3.3 million cubic yards) in the late 1960’s to 47.6 (62.2) in the late 1980’s. In the same period, the production of concrete blocks grew from 18.6 million units to 45 million. The pre-fab industry, almost non-existent until then, reached a level of four million square meters (43 million square feet) of annual capacity 10 years ago, enabling it to produce a large amount of commodities, from simple railroad ties to complicated engineering structures. Pre-fab for housing in 1986 was theoretically capable of producing enough structural pieces to build 40,000 dwellings a year, a figure far above the actual number of new housing units. Of the six cement plants currently operating, three were built after 1959 and the others have all undergone expansion and repeated improvement. They are located conveniently near the country’s oil refineries, thermoelectric plants and major power transmission lines, as well as close to the main cities, industrial cores, ports and railroad lines. Total annual production capacity of the factories is about 5 million metric tons. 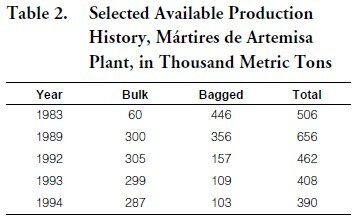 The leading plants are “René Arcay” (formerly “El Morro”), built in 1918 in Mariel, 27 miles West of Havana, and the “Carlos Marx” in Cienfuegos, which began production in 1980. Their combined nominal output equals 60 percent of national capacity. As in many other industries, however, real production never attained capacity. In 1989, to cite a good year, production was 75 percent of capacity; worse, average output for the 1980’s was only two-thirds of installed capacity. More important however, is the energy factor. It requires one barrel of oil to manufacture a ton of cement, resulting in a process in which oil consumption accounts for 60 percent of the cost of production. Furthermore, the cement industry consumed 12 percent of the electricity in the country in 1989. Given the scarcity and rationing of electrical power across the country, the industry has to limit its consumption and thus, its output. The sudden elimination of huge quantities of Soviet oil supplies after 1989 pushed the industry to its worst crisis. Lacking this crucial ingredient and faced with a shortfall in electrical energy, production plunged to one-fifth of the normal level in four short years. After the industry hit bottom, a concerted effort by the government to build new hotels and produce cement for export seemed to help turn it around. But in 1995, after a second consecutive year of growth, production reached 1.38 million tons, 31 percent more than in 1993, but 23 percent below 1994. 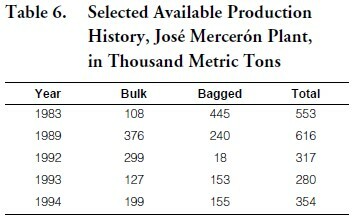 Projections for 1996 were 1.8 million tons, 30 percent above 1995, but equal to the production level in 1994. Following renewed trade relations between the United States and Cuba, the cement industry will benefit in three ways; the currently run-down plants will almost certainly be privatized, and will experience a boost in investment; through a cement-intensive hotel and tourism led construction boom and through being able to export to the cement hungry U.S. market.